Two German tourists have been killed in stabbings at a hotel beach in the popular Red Sea resort of Hurghada, Egyptian officials say. At least four other people were injured and a man has been arrested. The knifeman initially killed the two women before injuring two other tourists at the Zahabia hotel, officials told Reuters news agency. He then swam to a nearby beach and attacked and wounded two more people at the Sunny Days El Palacio resort before he was overpowered by staff and arrested. "He had a knife with him and stabbed each of them three times in the chest. They died on the beach," El Palacio hotel Security Manager Saud Abdelaziz said. Mr Abdelaziz said the injured include two Czechs and two Armenians. All are now being treated in hospital. 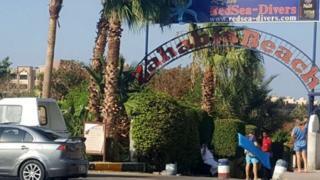 "He was looking for foreigners and he didn't want any Egyptians," a member of staff at the Zahabia hotel said. Initial reports had said those killed were Ukrainian, but Ukrainian officials denied this. It is unclear whether the attacker had any links to jihadist groups or whether he was psychologically disturbed, officials said. Egypt's security forces are dealing with an Islamist uprising in the country's Sinai Peninsula. The tourist industry has been targeted by militants in North Africa over the past few years. A Russian passenger plane was brought down by a bomb in the peninsula in October 2015, killing all 224 people on board. In June 2015 at least 39 people, mostly foreigners, were killed and 36 injured in an attack on a beach in the Tunisian resort town of Sousse. Can Egypt's tourism recover from latest blow? Who are Sinai militant groups?